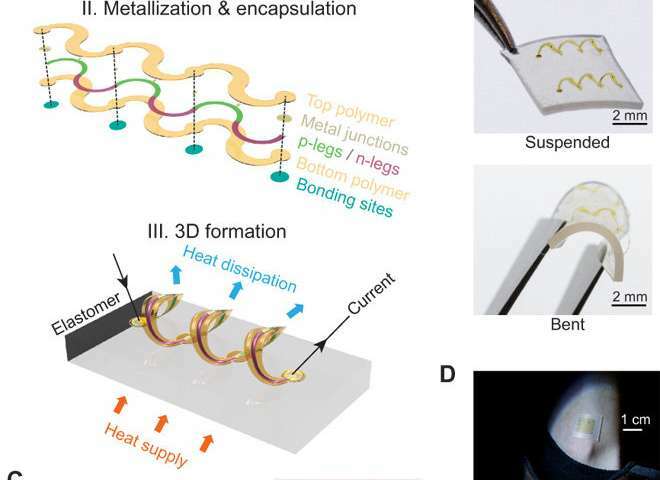 3D thermoelectric coils as active components of flexible and deformable systems to harvest electric power for wearable technologies. A) Schematic illustration of fabrication and 3D assembly. Thin-film p- and n-type materials were patterned into 2D serpentine shapes and transferred onto a layer of polyimide (PI) to form the active materials. The 2D precursor structures were completed with metal junctions and a surface coating of PI patterned via photolithography and etching. Chemical bonding such systems to pre-structured silicone substrates at selective locations were followed by pre-stretch to initiate a process of geometrical transformations to yield the final 3D architecture. B) Optical images of resulting 3D thermoelectric coils. The geometry of the structure and elastomer substrate combined to provide mechanical robustness against handling and mechanical deformation. C) An array of 8 x 8 coils. The magnified view shows the 3D structure is consistent to the geometry predicted by FEA. The colored profile represents strain in the silicon leg. D) The 8 x 8 array can be attached to the skin on the wrist and on the ankle. Photo credit: Xiwei Shan, UIUC Lab, Science Advances, doi: 10.1126/sciadv.aau5849. Miniaturized semiconductor devices with energy harvesting features have paved the way to wearable technologies and sensors. Although thermoelectric systems have attractive features in this context, the ability to maintain large temperature differences across device terminals remains increasingly difficult to achieve with accelerated trends in device miniaturization. As a result, a group of scientists in applied sciences and engineering has developed and demonstrated a proposal on an architectural solution to the problem in which engineered thin-film active materials are integrated into flexible three-dimensional (3-D) forms. The approach enabled efficient thermal impedance matching, and multiplied heat flow through the harvester to increase efficient power conversion. 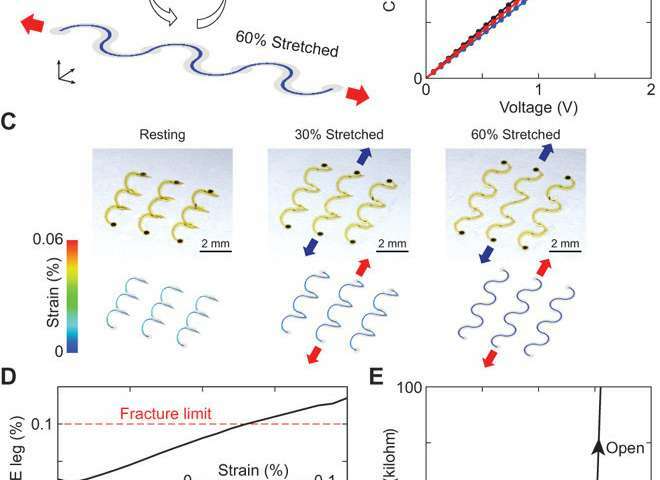 In the study conducted by Kewang Nan and colleagues, interconnected arrays of 3-D thermoelectric coils were built with microscale ribbons of the active material monocrystalline silicon to demonstrate the proposed concepts. Quantitative measurements and simulations were conducted thereafter to establish the basic operating principles and key design features of the strategy. The results, now published on Science Advances, suggested a scalable strategy to deploy hard thermoelectric thin-films within energy harvesters that can efficiently integrate with soft material systems including human tissue to develop wearable sensors in the future. Thermoelectric devices provide a platform to incorporate ubiquitous thermal gradients that generate electrical power. To operate wearable sensors or the "Internet of Things" devices, the temperature gradient between the surrounding environment and the human body/inanimate objects should provide small-scale power supplies. Continued advances in the field focus on aggressive downscaling of power requirements for miniaturized systems to enhance their potential in thermoelectric and energy harvesting applications. Integrated processors and radio transmitters for example can operate with power in the range of subnanowatts, some recent examples are driven via ambient light-based energy harvesting and endocochlear potential. Such platforms can be paired with sensors with similar power to enable distributed, continuous and remote environmental/biochemical monitoring. 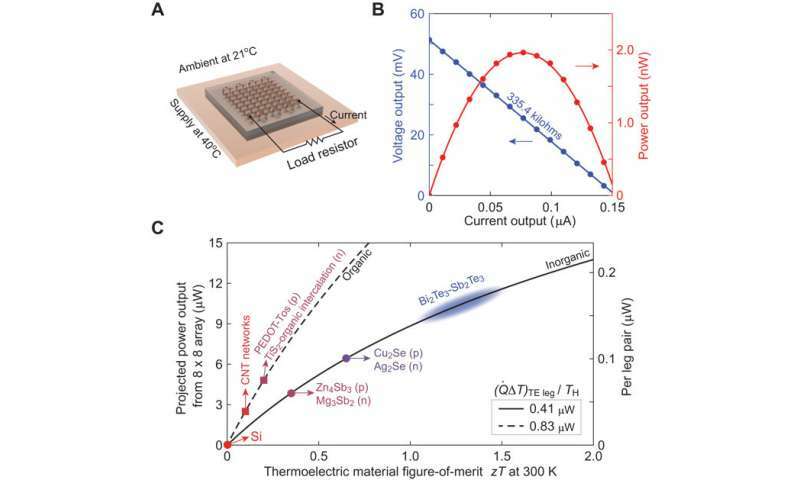 Two key challenges in the development of miniaturized thermoelectric harvesters include matching the requisite thermal impedance and mechanical compliance of the active materials to integrate in biological systems. A well-developed system for device flexibility includes combining thin film polymers with metal foils such as wires or ribbons. In the study, Nan et al propose and demonstrate a solution by developing a two-dimensional (2-D) precursor system in the development of functional 3-D helical coils. The naturally flexible nature of the coils enabled the systems to conform to complex biological surfaces, even those dynamic with time, to ensure excellent thermal contact with the heat source. Furthermore, the 3-D nature of the system provided a multifold increase in the surface area for higher heat exchange capacity to yield maximum power. The thermoelectric helical coil architecture was fabricated using monocrystalline silicon as the active material. The mechanically guided assembly generated 3-D helical structures from 2-D serpentines via compressive buckling. The serpentines incorporated silicon ribbons with p- and n-type segments, and the system was encapsulated on the top and bottom with polymer coatings. The architecture enabled transformation of the system from 2-D to 3-D during deployment and use. Although heavily doped with silicon, the 3-D coils were able to provide remarkable levels of mechanical compliance and robustness during handling and bending applications. The assembly did not significantly deviate from the geometry predicted using finite element analysis (FEA). Such material characteristics made the system well-suited to form intimate thermal interfaces to the human body, such as the wrist or ankles. Mechanical deformability and durability of 3D thermoelectric harvesters. A) simulated distributions of strain in the silicon thermoelectric leg before and after uniaxial stretching in the plane by 60 percent. Results indicated reductions in strain on stretching as expected based on compressive buckling used to form 3D structures. B) Results of experimental durability tests involving multiple cycles of uniaxial stretching and release on a coil structure. The data only indicated a small increase in the electric resistance. C) Optical images (top) and simulated structures (bottom) after in-plane stretching. D) Simulated values of the maximum local strain. A maximum compression of 26 percent is possible prior to reaching fracture strain of silicon – the limiting factor of the system. Inset shows the deformed structure after compression and includes a strain distribution map of the silicon leg alongside the fracture point. E) Experimental measurements of the device resistance upon vertical compression. At a compression of 40 percent, the device showed open-circuit behavior due to silicon fracture. Credit: Science Advances, doi: 10.1126/sciadv.aau5849. To improve mechanical and thermal properties of the 3-D coils, the scientists used FEA software for computationally guided optimization of the resulting device. In principle, the 3-D architecture of the device was advantageous for effective harvesting. Therefore, by design, the 3-D helical coil system included a tapering geometry that increased in width toward the top as engineered using FEA to optimize thermal and mechanical responses. The design scheme in the study was enhanced specifically for harvesting in miniature devices. Increased cooling capacity of the device design had greater benefits to contrast any losses owing to parasitic heat flow in the system. Nan et al, also conducted mechanical compliance tests on the devices to understand their capacity to endure substantial bending, in-plane stretching and out-of-plane compression, as with previous reports. The 3-D structures could be stretched by up to 60 percent in the in-plane direction for hundred cycles and vertically compressed up to 30 percent, with minimal degradation in electric properties. The devices showed exceptional mechanical compliance as predicted by FEA. Uniaxial stretching across 200 cycles did not result in electrical or mechanical failure. The 3-D coil showed resilience with potential for interfacial integration within miniature devices. Energy harvesting with thermoelectric coils and a road map for power enhancement. A) Schematic illustration of the measurement conditions testing the performance of harvesting devices. B) Measured power output characteristics showing a maximum power of 2 nW. C) Projected power output achieved by using known thermoelectric materials with thermoelectric figure-of-materials zT higher than that of Si. Credit: Science Advances, doi: 10.1126/sciadv.aau5849. Power output projections of the harvesting devices were also characterized to show consistent results aligned with design expectations. The open-circuit voltage of the device did not diminish across time in the measurements indicating that the thermal profile of the device was in a steady state. In the study, the authors generated a road map for power enhancement and a fabrication scheme to engineer energy harvesting devices with materials other than silicon – including organic variants. The authors recommend additional research on deposition methods, doping and patterning for organic and composite materials. The materials should not succumb to electrical resistance during mechanical transformation from 2-D to 3-D. With silicon used in the study, a three-fold increase in resistance was observed during the transformation potentially due to electrode contact, device degradation or plastic deformation in some parts of the device. The study represents a promising strategy to integrate thin-film materials in harvesters with soft material systems (including human skin) to realize energetically optimized wearable electronic devices in the future.